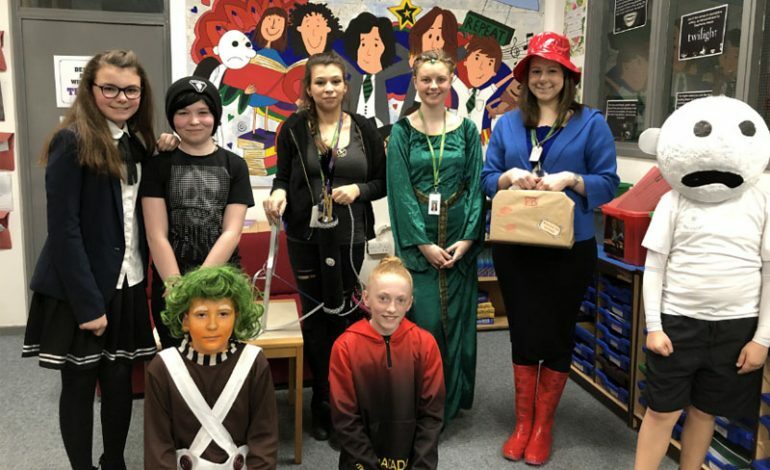 Students at Woodham Academy had lots of fun on World Book Day celebrating authors, illustrators, books and of course – reading! The English department at Woodham dressed up as their favorite book characters once again – and much to the delight of the students. This year, Year 7 were invited to dress up too. The quality and effort that had gone into the costumes made choosing a winner a real challenge. The prize however, was awarded to Joe Ingman (pictured) who dressed as Greg from the popular fictional series Diary of a Wimpy Kid. Lunchtime in the Reading Rooms saw a whole host of activities to engage the students with books. The students particularly enjoyed a competition where staff had sent in photos of their bookshelves and the students had to guess who the ‘shelfie’ belonged to. Reading coordinator Miss Thomas said: “Here at Woodham reading is at the heart of everything we do, but we also have a responsibility to make reading relevant and current. “We have heavily invested in the reading resources we have in school, we are committed to providing the latest novels, and moreover ensuring that all students in Year 7 make rapid progress when it comes to reading.